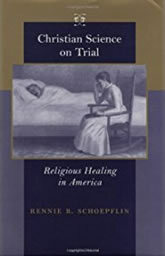 In Christian Science on Trial, historian Rennie B. Schoepflin shows how Christian Science healing became a viable alternative to medicine at the end of the nineteenth century. Christian Scientists did not simply evangelize for their religious beliefs; they engaged in a healing business that offered a therapeutic alternative to many patients for whom medicine had proven unsatisfactory. Tracing the evolution of Christian Science during the late nineteenth and early twentieth centuries, Christian Science on Trial illuminates the movement’s struggle for existence against the efforts of organized American medicine to curtail its activities. Physicians exhibited an anxiety and tenacity to trivialize and control Christian Scientists which indicates a lack of confidence among the turn-of-the-century medical profession about who controlled American health care. The limited authority of the medical community becomes even clearer through Schoepflin’s examination of the pitched battles fought by physicians and Christian Scientists in America’s courtrooms and legislative halls over the legality of Christian Science healing. While the issues of medical licensing, the meaning of medical practice, and the supposed right of Americans to therapeutic choice dominated early debates, later confrontations saw the legal issues shift to matters of contagious disease, public safety, and children’s rights. Throughout, Christian Scientists revealed their ambiguous status as medical practitioners and religious healers. The 1920s witnessed an unsteady truce between American medicine and Christian Science. The ambivalence of many Americans about the practice of religious healing persisted, however. In Christian Science on Trial we gain a helpful historical context for understanding late–twentieth-century public debates over children’s rights, parental responsibility, and the authority of modern medicine.